The feature can be used to create separate PST file for names.nsf database. To activate this feature, check the same option. The feature is helpful to migrate required folders only. For that, mark all required folders and un-mark all un-desired folders. Software exports all categories (Emails, Contacts, Calendars, Tasks, Journals) data but any category can be excluded or included for migration using this feature. For that, check to include and un-check to exclude. If Mails category is on, Filters can be added. For that, select Apply Filters and set From and To date for migration. If Contacts category is enabled, Duplicate contacts can be excluded for migration. For that, Check Export Duplicate Contacts option. Properties to find out the duplicates can be also selected using Set function. If calendars category is enabled, filters can be applied for Lotus Notes calendars to Outlook migration by setting From and To date. Both category works as same as Calendars. Software has various advance options to deliver successful migration in critical environments. Function can be enabled to get output emails with maintained html formatting. The function can be applied to get migrated emails by removing the encryption. Features can be used to migrate all data stored inside All Documents view. For that, just enable the option. By enabling this feature, all doclinks of emails will be maintained after migration. 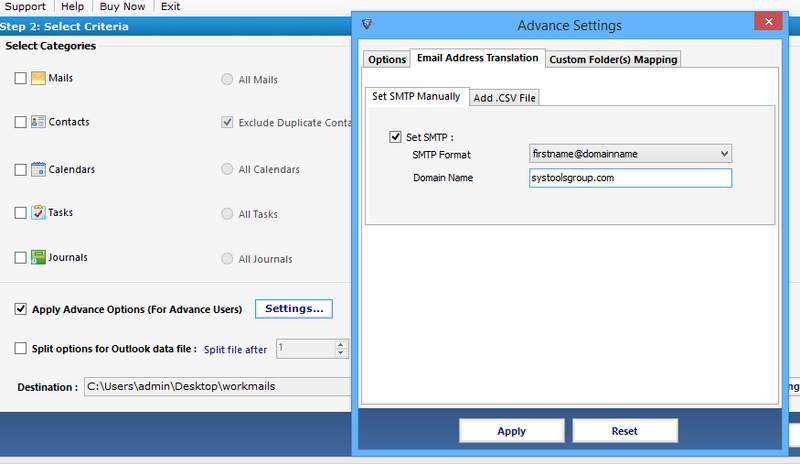 The feature allows Lotus Notes CN (Canonical Name) value mapping with MS Outlook SMTP format. For that, just put the domain and select desired SMTP format (Tool inbuilt with more than 8 SMTP format). Multiple canonical name can be mapped also using Add .csv file option. Lotus Notes system defined mail folders (such as : inbox, sent items etc) data can be migrated inside any MS Outlook system defined folder or any user defined folder by applying folder mapping. The feature allows splitting of output pst file according to given size. For that, just enable the option and set the desired size (in mb or gb). Software by default saves migrated data on desktop but using the Change option, destination can be set up on any desired location. This feature shows current progress and Final Report of migration process. Counting of each items is shown according to running process. 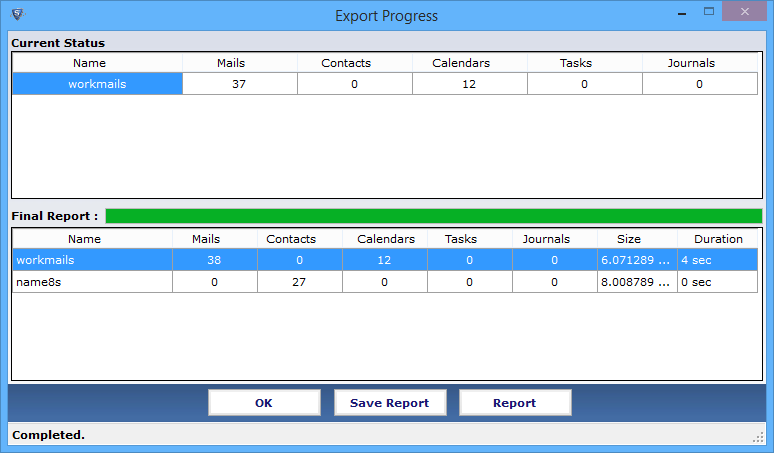 Software creates two reports: one for successful and one for interrupted migration so that each bit of data can be verified and compared after migration. 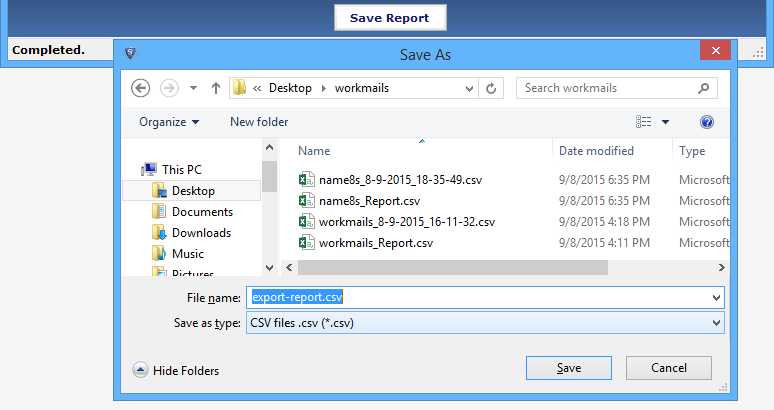 Using save report feature, Export Progress (which is showing on software interface) can be saved into a .csv file so that it can be used after closing the software window. The feature is helpful for multiple nsf files migration. Software asks for another file migration, just click on Yes to proceed further. The software will migrate Notes emails to Outlook with their attachments like images & other documents. The tool also able to export other items of Lotus Notes such as contacts, calendars, tasks, notes, journals and save into Outlook 2016, 2013, 2010, 2007 compatible PST file. Moreover, the Notes to Outlook Migration Utility provides email filter option to export selected emails within the selected date range. Lotus Notes to Outlook converter tool provides an option to convert Notes contacts to PST, you need to provides Names.nsf path to migrate Lotus Notes contacts to Outlook. You can apply contact filter option to remove duplicate contacts. 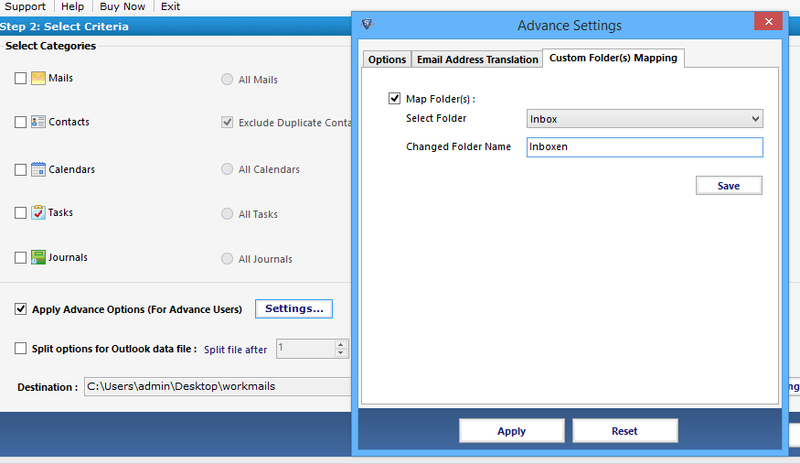 With this software, you will export calendar of Lotus Notes to Outlook. The software allows you to export IBM Notes calendar to PST format. If your requirement to migrate calendar entries of specific date range then you have to use calendar filter option. 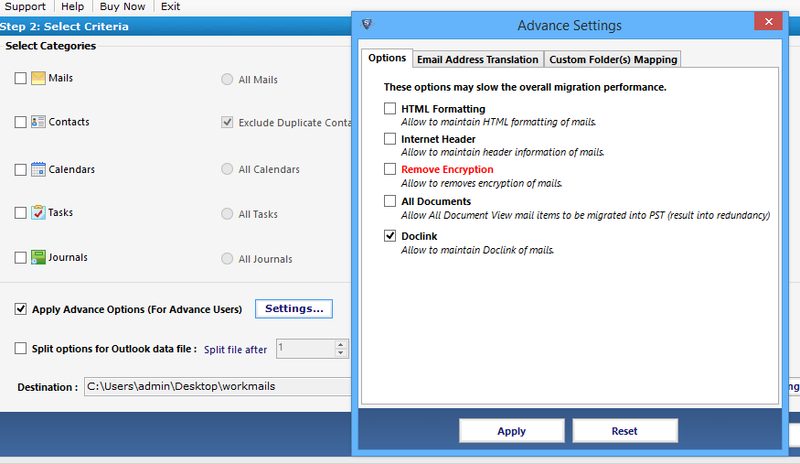 This option of Lotus Notes NSF to Outlook migration tool will maintain all doclink of emails, to use this feature you need to enable Doclink option. Software retaining all doclink of emails during & after conversion of Lotus Notes NSF to PST. Lotus to Outlook conversion software allow you to export selected folders from Lotus Notes NSF to Outlook PST. The software provides an option in which you can select & export folders or components of Notes database. Lotus Notes converter utility is capable to remove NSF emails encryption, to perform this task tool offers "Remove Encryption" option. This feature will help you to export entire data from IBM Notes to Outlook. As well as tool will maintain Internet Header Information of emails during the conversion of Lotus Notes Archive to Outlook PST. This application support latest edition of both source & destination platform, it supports Outlook 2016 & lower edition and Lotus Notes 9.0 & below versions so tool allows you to import data from the latest edition of Notes to Outlook 2016, 2013, 2010, 2007, 2003. Software required Notes & Outlook installation to perform migration of Lotus Notes to Outlook. The IBM Notes to Outlook software provides an advanced feature in which you can detect & convert canonical name format of any senders email address, moreover you can set SMTP format for all canonical values. Also provides Mapping CN value option for Name.nsf, by using this option you can replace Name.nsf CN value with email address & contact information. Export Notes & How it Converts Better? Lotus Notes to Outlook is most desirable conversion by users who wants to access NSF file in PST file. Export Notes easily convert Lotus Notes mailbox to Outlook PST file and enriched with great and unique features. Perform Lotus to Outlook migration in few simple steps. Reliably transfer Notes to Outlook even when the NSF is encrypted. Log file and CSV file created after export process which keeps a records and counts of what is exported and in what amount. Export Lotus NSF file to Outlook PST with maximum support for HTML, RTF and TXT format. Also move in-line images, background images (copied or pasted). Customized langauage translation support as user can map one folder language into desired language folder. Read only (Safe and Secure) – reads NSF file in same way as the Lotus Notes client. No change in access mode after Lotus Notes NSF to Outlook PST conversion. Keeps all Meta properties (To, Cc, Bcc, From, Sent Date & Time, Received Date & Time, Subject, Signature etc). Customizable interface and Services – With advance settings the interface can be changed, we provide customized service for migrating large amount of NSF data. Why Customer Prefer Lotus Notes Converter? We have 100+ trusted resellers across many countries which proves our credibility. Qualified developer grade support – All queries listened carefully and resolved patiently. Established Credibility – Our user and reputed client speaks our reliable delivery of services, we develop, sell and support our own products and try our best to assist you. Reliable Cost – Our per user based licensing work same as Enterprise and business license. While hand over license to you, we assure best 24X7 support for larger migrations. Developer are Lotus Notes & Domino Specialist, thus developed more than 20 successful product for Domino Server & Lotus Notes. Multiple software websites for vast presence. All are equipped with well user guided information like Video, How it Works, PDF Help file, CHM and Demo version. Click on Export to start conversion. You should test Lotus Notes to Outlook migration tool before investing in this, free version is available for testing that shifts 25 items of each folder from Lotus Notes to Outlook file. After clearyfying all the doubts and queries you can Purchase our Licensed Edition of Lotus to Outlook migrator. Used many tools but never experienced such a feature rich Lotus Notes NSF to Outlook converter, which export multiple NSF file to Outlook with advance options. Tried Export Notes NSF to Outlook converter and get the solution to cut down my extra time with its rich filtering option and got the confined results within few seconds. For the IBM Notes nsf to pst conversion, I was in a perplexing of best software selection, which ended here. The software confers outstanding performance in converting Notes database. System admin decided to use MS Outlook instead IBM Notes. For that existing nsf database of 200 employee are needed to import Lotus Notes Database to Outlook PST. The Tool exported all database without loss of any info. Have Query Related to IBM Notes to Outlook Migration? How to migrate encrypted NSF file? How to convert names.nsf file? How to do bulk or batch conversion of IBM Notes to Outlook? How to maintains HTML formatting? How to export local security protected nsf file?